It’s good news that the provincial government is proceeding with the next section of bus lane on Douglas Street in Saanich. The Better Transit Alliance also agrees with columnist Jack Knox that “continuous, dedicated transit lanes between downtown and the West Shore, allowing buses to blow past the Crawl” is a practical way to provide congestion relief. The provincial government could complete the shoulder bus lanes on the Trans-Canada Highway to the 6 Mile Pub area within 24 months for a very reasonable cost. B.C. committed to spend less on urban highways and more on transit in the 2016 federal-provincial climate framework. The Ministry of Transportation and Infrastructure has funds that can be diverted from urban highway expansion, which only worsens traffic and climate pollution. 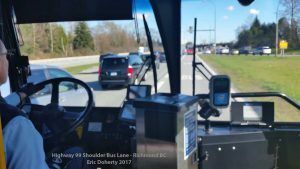 It is time to get the Trans-Canada Highway bus lanes built, then start immediately on the Pat Bay Highway bus lanes.